Another week has come and gone and another chance at having the best week ever. And EVERY week is the best week ever because every week is another chance to love, laugh, live and breathe. But it takes work! Effort must be made every day to make it the best day in order to live your best life. Have you taken the Friday Happy Hour Challenge? 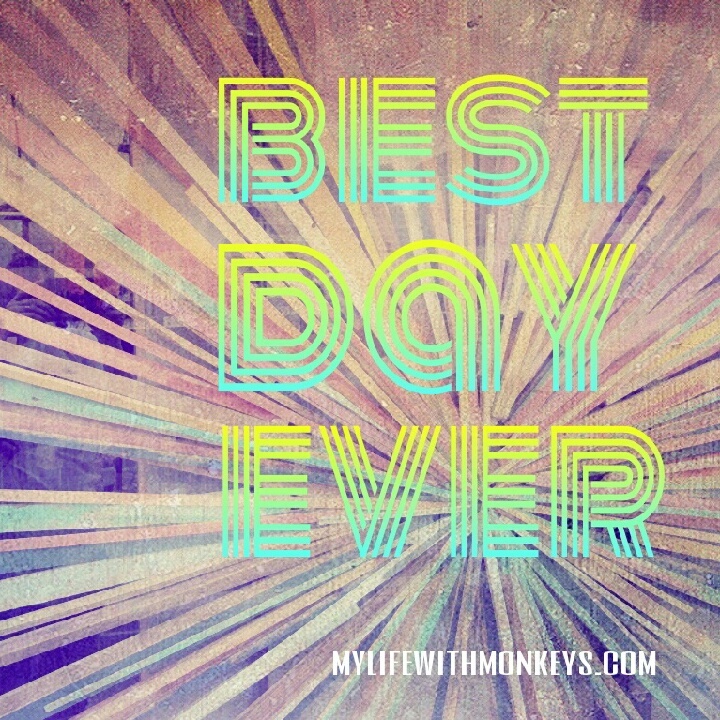 I think everyone could use a little nudge, so today I am introducing “Best Day Ever”. 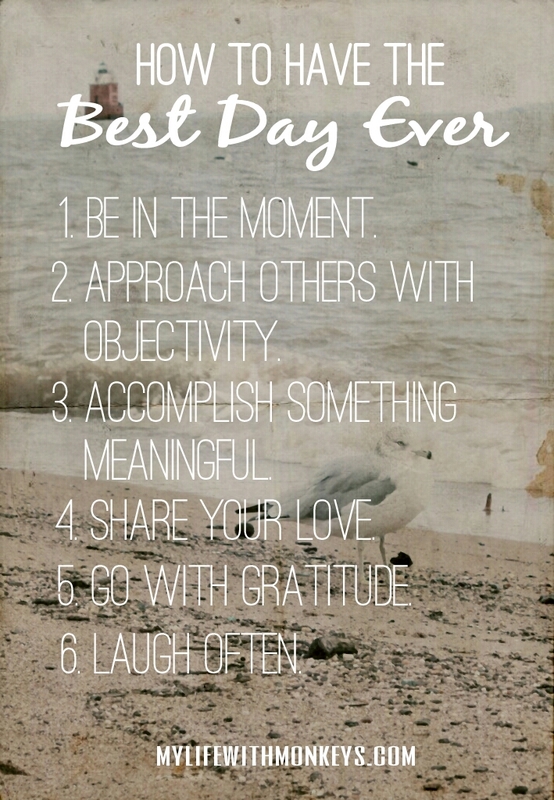 These are six simple things to make your day a better day. If you have a happy day today, by the end of the week you’ll have a bunch of happy days and end up having the best week ever. Soon you will find you’ve had a few great weeks and before you know it you’ll have the happy life you’ve been looking for all along….simple mathematics. But it starts with just one day. Let’s start today, Okay? Every morning is an opportunity to wake with a fresh start. Let go of yesterday’s mistakes and tomorrow’s worries; you have a chance to get it right today. This is a new day full of possibilities – be present for it. 2. Approach others with objectivity. Scientists are responsible for putting aside their biases and beliefs to see the world as it really is. Rather than being irritated, easily offended or judging others, choose open mindedness. Aren’t we all just trying to make our way through a chaotic world? You’ll feel better when you cross at least one thing off your to-do list and even better about the day if you make it meaningful. If you have goals and dreams, see yourself closer to them by doing something with purpose today. Take time to connect with the people in your life. The more love you give, the more love you have. Say thank you, thank you, thank you for this day. When you focus all your thoughts on what’s right, even if it’s the smallest of goodness to be found, you cannot help changing your whole outlook. Gratitude will create a beautiful life. Laugh out loud. Laugh until you can’t breathe. And don’t forget to smile while you’re at it…. This was the best week ever. So many laughs and things to be grateful for. Did you have a great week? Did you have the best day ever? Thank you for joining me on this great journey! Seeing your name pop up in my comments made me realized I haven't stopped by to see what you're up to in a while! I LOVE, LOVE this post! Such wonderful, positive insight. Would you mind if I link to you in my next blog post :)? I'd love to share this out! Excellent post, Kellee and I really love your image! I love this post, Kellee! I was trying to pick my favorite out of the things you listed and I can't! They're all awesome. Hey! Have you been reading my mind? These last few months I've been living by this creed and my life has really changed. I admit, I'm still not doing number 6 much, but I'm working on it. Best week ever....Best post ever. Thank-you everyone for the enthusiasm! I'd love it if any of you take time to share this post - the more people who have the best day ever - the better the world will be! Friday Happy Hour: It's Your Turn!